The most effective way to develop leaders and high-potential individuals today is with COACHING. The basics can be learned in training classes, but it’s not enough. We know that individual coaching is needed. Research shows that coaching builds leadership bench strength and significantly improves retention, productivity, and employee engagement far more effectively than just training. We believe in setting measurable goals and the results are outstanding. Most global coaching providers focus on senior executives and charge a large fee accordingly—a fee that could be significant to almost any budget. Positive Coach has created a more efficient way to manage these large contracts with improved quality control processes and powerful coaching results. With a global team of experienced, certified coaches, we provide targeted, cost-effective coaching programs for all employee levels and in major markets throughout the world. Here’s a quick comparison chart to help you choose the right program. 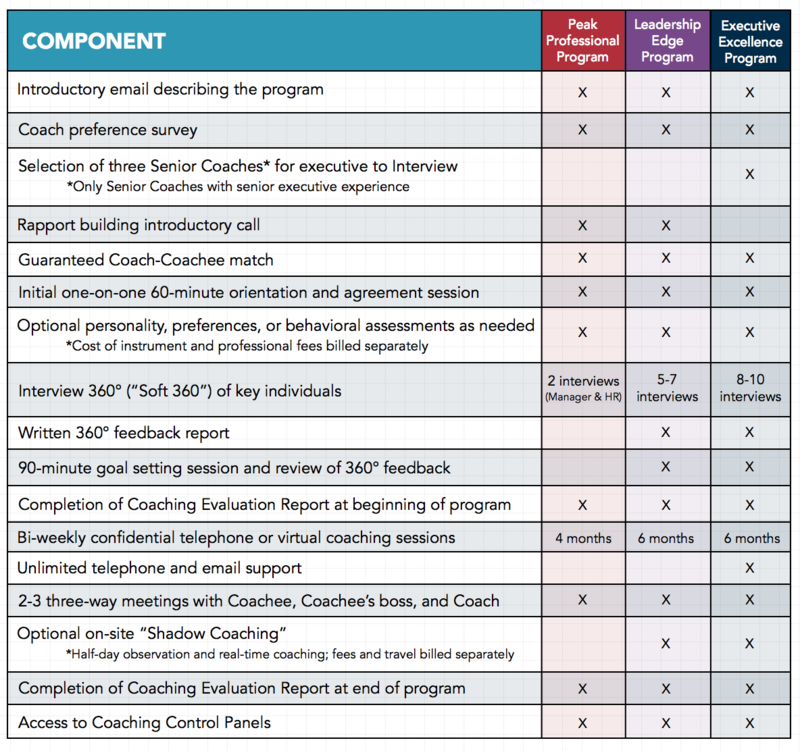 Of course, programs can be easily customized to fit specific coaching objectives or organizational goals. Identify the leader or high potential who is ready for coaching. Contact Positive Coach at 972-733-9963 or ClientSupport@PositiveCoach.com. Choose the right program and options for your candidate. Assist Positive Coach with vendor approval and PO or other payment arrangements. Send Positive Coach the candidate’s name, email address, phone number, and also the manager’s name, email address, and phone number. Positive Coach will then send the Coach Preference Survey to the candidate and invoice the company. We are dedicated to making this the most important professional development process available at the most competitive price in the market. Recieve new information about leadership, coaching, careers, and other interesting, newsworthy topics. How Well Would You Do in the Shark Tank? Need Some Leadership Coaching?